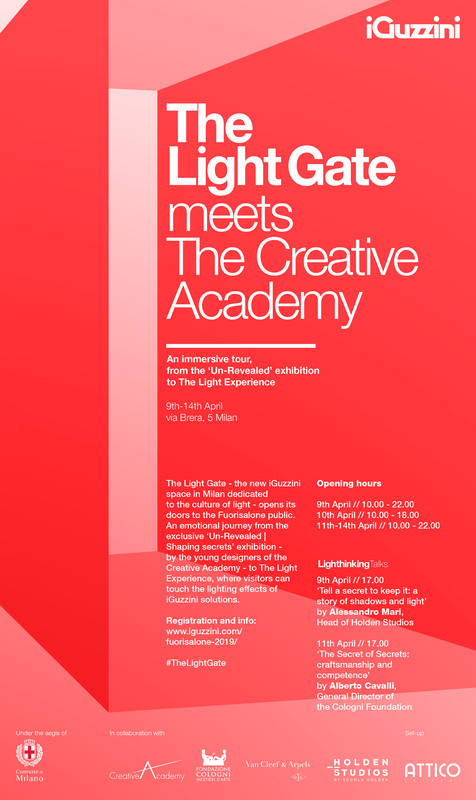 The Light Gate - the new iGuzzini space in Milan dedicated to light culture - opens its doors again to the Fuorisalone public, from 9th to 14th April with an emotional experience mapped out in different, but interconnected stages. A maze of light and shadow, reflections and niches, screens and partitions hides the secrets of the UN-REVEALED | Shaping secrets exhibition inspired by the “Le Secret” collection of luxury jewellery created by Van Cleef&Arpels. 20 young international artists from the Creative Academy - the Richemont Group’s Corporate School - worked closely together with exceptional Master Craftsmen to create unique, multi-faceted items concealing mysterious secrets. This maze leads to The Light Experience, the location in Milan where visitors can enjoy a first-hand experience of iGuzzini lighting, making it even more exciting and immersive. Displayed in a spectacular show of music and sound, the luminaires’ different light effects offer a cryptic demonstration of their real-life applications. The space is outlined with simple blades of the light on the walls and the visitor is led forwards by an interplay of movements, shifts and rotations. To enjoy the tour, registration is mandatory: click here. The secrets that characterise The Light Gate also find a human voice in the exhibition’s Lighthinking Talks. In the courtyard of The Light Gate, on 9th April at 5pm, Alessandro Mari - the Creative Director of Holden Studios - will recount the secrets of storytelling in a talk entitled ‘Telling a secret in order to keep it: a story of light and shadow’; and on 11th April at the same time, Alberto Cavalli - General Director of the Cologni Foundation - will discuss the question of Art & Craft professions in ‘The Secret of Secrets: craftsmanship and skill’. Admission for both Lighthinking Talks is free. The event has been organised with the sponsorship of the Municipality of Milan and in collaboration with the Creative Academy, the Fondazione Cologni dei Mestieri d’Arte, Van Cleef&Arpels and the Holden Studios by Scuola Holden.